At this years the meeting of the Canadian Astronomical Society, astronomers revealed a treasure trove of “red nugget” galaxies discovered by combing through the Sloan Digital Sky Survey database. Cambridge, Massachusetts – The world of astronomy has changed. An astronomer used to have to travel to a remote location and endure long, cold nights, patiently guiding a telescope to collect precious photons of light. Now, a proliferation of online archives allows astronomers to make discoveries from the comfort of their own offices. By mining such archives, a team of astronomers led by Ivana Damjanov of the Harvard-Smithsonian Center for Astrophysics (CfA) has found a treasure trove of “red nugget” galaxies. These galaxies are compact and densely packed with old, red stars. Their abundance provides new constraints on theoretical models of galaxy formation and evolution. “These red nugget galaxies were hiding in plain view, masquerading as stars,” says Damjanov. She presented the team’s research today at a meeting of the Canadian Astronomical Society (CASCA) in Quebec, QC. When the universe was young, dense, massive galaxies nicknamed “red nuggets” were common. These galaxies are ten times more massive than the Milky Way, but their stars are packed into a volume a hundred times smaller than our Galaxy. Mysteriously, astronomers searching the older, nearer universe could not find any of these objects. Their apparent disappearance, if real, signaled a surprising turn in galaxy evolution. To find nearby examples, Damjanov and her colleagues Margaret Geller, Ho Seong Hwang, and Igor Chilingarian (Smithsonian Astrophysical Observatory) combed through the database of the largest survey of the universe, the Sloan Digital Sky Survey. The red nugget galaxies are so small that they appear like stars in Sloan photographs, due to blurring from Earth’s atmosphere. However, their spectra give away their true nature. The team identified several hundred red nugget candidates in the Sloan data. Then they searched a variety of online telescope archives in order to confirm their findings. In particular, high-quality images from the Canada-France-Hawaii Telescope and the Hubble Space Telescope showed that about 200 of the candidates were galaxies very similar to their red-nugget cousins in the distant, young universe. “Now we know that many of these amazingly small, dense, but massive galaxies survive. They are a fascinating test of our understanding of the way galaxies form and evolve,” explains Geller. The large number of red nuggets discovered in Sloan told the team how abundant those galaxies were in the middle-aged universe. That number then can be compared to computer models of galaxy formation. Different models for the way galaxies grow predict very different abundances. The picture that matches the observations is one where red nuggets begin their lives as very small objects in the young universe. During the next ten billion years some of them collide and merge with other, smaller and less massive galaxies. Some red nuggets manage to avoid collisions and remain compact as they age. The result is a variety of elliptical galaxies with different sizes and masses, some very compact and some more extended. “Many processes work together to shape the rich landscape of galaxies we see in the nearby universe,” says Damjanov. Compact quiescent galaxies (‘red nuggets’) constitute a large fraction of distant massive quiescent systems, but were thought to disappear at low redshift. However, recent studies at z~0 have shown that their number density in the nearby Universe is not well constrained. Furthermore, the link between red nuggets routinely observed at high redshift and their rare local analogs and/or relics is still missing. 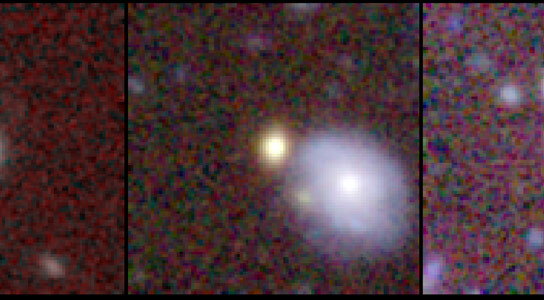 We discovered a population of these objects at z~0.4 by searching the SDSS/BOSS database for photometric point sources exhibiting spectroscopic features of redshifted quiescent galaxies. We combed through the existing high-quality ground-based and HST images in the visible and near-IR wavelength range to confirm their compactness. Our targets fall in the locus of z~0 and z>1 red nuggets on the dynamical Fundamental Plane. We report on number densities of compact quiescent galaxies at 0.2<z<0.6, thus providing an important constraining factor for models of massive galaxy assembly. Be the first to comment on "Sloan Digital Sky Survey Reveals Treasure Trove of “Red Nugget” Galaxies"